Review: "Points North: Road Less Travelled" - Sea of Tranquility - The Web Destination for Progressive Music! 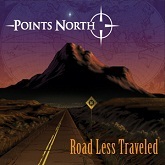 Points North is a instrumental rock trio comprised of guitarist Eric Barnett, bassist Uriah Duffy (ex-Whitesnake), and drummer Kevin Aiello, and their debut for Magna Carta Records is titled Road Less Travelled. These three are all seasoned veterans of the music scene, and you can hear all the experience, miles, and wisdom they've accumulated on the road and in the studio throughout this very enjoyable CD. From the first song "Vast Horizons", you instantly hear the influence of Steve Morse and his two bands The Dixie Dregs and The Steve Morse Band. Barnett is an extremely talented player, whose lyrical style blends influences from Morse, Steve Vai, Joe Satriani, and Eric Johnson. The songs the band have put together are extremely melodic instrumental rock tunes, instantly memorable and containing plenty of tasty soloing, mostly from Barnett, and rock solid rhythms. Barnett's electrifying leads on "The Phoenix" are jaw dropping, while other tracks like "Grace Under Pressure", "Barney", and "The Source" combine lush textures, jazzy sophistication, and rock firepower. "Steve's Morsels" almost comes across like a tribute to the Deep Purple/Dixie Dregs/SMB legend, as Barnett lets loose with a flurry of gymnastic, rapid picked solos and riffs that that has Steve Morse stamped all over it. On "Maiden Voyage" the trio settle into some serious prog-metal styled grooves, with Duffy and Aiello really locked into a tight rhythm and Barnett laying down a wide assortment of meaty riffs and fleet fingered leads. Damn impressive! Road Less Travelled is one hell of an enjoyable instrumental CD from Points North. The band has been out on the road with acts such as Uli Jon Roth, Blues Traveller, Kings X, Eric Johnson, UFO, Michael Schenker, Al DiMeola, Steve Morse Band, George Lynch, Pat Travers, and many others in recent months, so chances are you might get a chance to see this hot band opening up for some of your favorites. If so, prepare to be amazed.